Tagline: "It's 1994! The future is music and music is their future!" 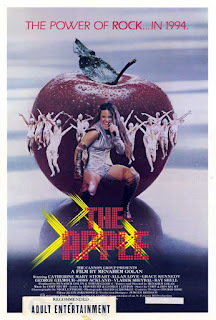 For years I’ve been hearing how The Apple, a 1980 disco musical / fantasy directed by Menahem Golan, is one of the worst movies ever made. After finally seeing it for myself, though, I can honestly say I was expecting worse. Yes, The Apple is a bad film, but it also has an energy that is impossible to ignore. Set in the distant future of 1994, The Apple tells the story of two young lovers, Alphie (George Gilmour) and Bibi (Catherine Mary Stewart), who dream of making it big in the music business. Unfortunately, Alphie can only write love songs, and what the public wants is the wild dance music being churned out by BIM studios. BIM, which stands for Boogalow International Music, is the brainchild of Mr. Boogalow (Vladek Sheybal), a powerful record producer whose most popular act, Dandi (Allan Love) and Pandi (Grace Kennedy), recently won the Worldvision Music Contest. Still, there’s something about Alphie and Bibi that impresses Mr. Boogalow, and he offers both of them long-term contracts. Alphie, who dislikes what Boogalow and his entire organization stand for, refuses to sign. Alas, he is unable to convince Bibi to follow his lead, and a few short months after signing with BIM, she has become an even bigger star than Dandi and Pandi. As for Alphie, he’s stuck writing sappy ballads that nobody wants to hear, and is so poor that he can’t afford to pay his landlady (Miriam Margoyles) the back rent he owes her. Yet, through it all, Alphie still has feelings for Bibi, and he tries to get Boogalow to release her from her contract. What Boogalow doesn’t know, though, is that Bibi’s love for Alphie is equally strong. But is she willing to risk everything just to be with him, or is her career now the most important thing in Bibi’s life? With its very ‘80s vision of the “futuristic” ‘90s (complete with oddly-shaped station wagons and shiny, metallic clothing), The Apple features a rags-to-riches love story that, at best, is under-developed (one minute, Bibi is on top of the world, performing in front of thousands of adoring fans and having the time of her life. The next, she’s pining for Alphie and threatening to quit the BIM organization altogether. Why the sudden change of heart? Who knows? It’s never really explored). Even more bizarre is the film’s religious subtext; in numerous scenes, Mr. Boogalow is depicted as the Devil, and the title number “The Apple” (which is set in Hell) is a musical take on the story of Adam and Eve (with Bibi being tempted by Boogalow to “bite the apple”). As for the performances, both Gilmour and Stewart are convincing as the naïve Alphie and Bibi, while Vladek Sheybal’s Boogalow is a villain with charisma to spare. Yet what really sets The Apple apart is its elaborate musical sequences, which are energetic (“Showbizness”), frightening (as we see during “The Apple”, the inhabitants of Hell are kinda freaky), confusing (the playful “How to be a Master” popped up at the wrong time, undercutting one of the movie’s more dramatic scenes), and downright obscene (“Coming”, performed by Grace Kennedy, is chock full of sexual innuendo and imagery). With the exception of “Universal Melody” (which Alphie and Bibi perform together on-stage), the musical numbers in The Apple are so amazingly over-the-top that they’re sure to make you smile from ear to ear. Despite Menahem Golan’s somewhat tarnished reputation (his status as the Schlockmeister General of the ‘80s was reinforced in the excellent documentary Electric Boogaloo: The Wild, Untold Story of Cannon Films), he was far from a talentless hack. Along with inspiring the Ninja (Enter the Ninja) and breakdancing (Breakin’) crazes of the 1980s, he directed The Delta Force, a highly charged action film that’s also one of Chuck Norris’s finest pictures. More than anything, though, Menahem Golan, like Ed Wood before him, clearly adored the cinema, and even if he wasn’t the most skilled filmmaker, his love for movies had an infectious quality that often made its way into his work. So, ridicule The Apple if you must (I did so myself while watching it), but don’t listen to those who tell you it’s the worst pictures ever. It is definitely bad. But “worst ever”? Not by a long shot!